You may be surprised to see 34,000 seats in the fourth league. But you may be even more surprised to see most of them filled! But hey, in Izmit supporters even packed their old stadium to capacity when they played a league lower. This one was needed, simply. 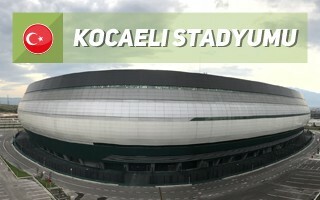 Publicly-financed stadium for a 4th-league club with capacity of over 30,000? This must sound irrational but Kocaelispor isn't just a football team. Their passionate following is known nationwide and in 2015 they've set the record of almost 21,000 people at a 5th-league game (which can be seen in the clip below)! Regular turnout may not be as impressive but with expected growth demand should reach the indicated stadium size. The project was directed by Turkish Housing Administration (TOKI) as part of the nationwide stadium-building scheme. Like in many other cities, Izmit was to get a new stadium far away from the old one. But unlike other cities, the new location is actually closer to the city centre, even if more remote historically and just outside city-proper. A hillside plot was selected, previously used as a small athletics stadium, historically a quarry. Original concept was created by Alper Aksoy's team back in 2013 and already by summer of that year excavation began. A lot of soil had to be removed because the investor decided to make use of the stadium's hillside placement by adding underground parking of 1 level around the perimeter and 2 levels in the south. Actual construction was launched in the summer of 2014 and delivery was initially expected to happen by the end of 2016. While the stadium was almost ready structurally, it wasn't opened until mid-2018. Inspiration for the selected architectural form was a delicacy known across the Balkans and Turkey, pişmaniye. It's a ball-shaped candy floss roll, consisting of fine strips of white fabric. In Izmit the white colour scheme had to be joined by team colours, thus black and green strips were also added. Initially they were supposed to wrap the stadium diagonally but during optimisation of the design it was changed for less dynamic horizontal layout. Part of the dark green strips is glazing, which allows sunlight to enter the otherwise opaque form. The seating layout is conventional, divided into two tiers. With front row just 7.5 meters from the field at closest, the lower tier is rather flat (22 degrees). Its upper continuation is much steeper with rake of over 30 degrees. The symmetric form is robust in size, with stands reaching height of 22.5 meters. The transverse axis is 200 meters and the longitudinal axis is 238 meters. Though not required by short- or medium-term local needs, the stadium is fully equipped to host international events with over 500 media seats, over 6,000 business seats and 48 boxes in the west and east stands. Interestingly, there are two public concourses behind the stands rather than one. It's thus no wonder that the stadium's overall floor space is large, 43,000 m2. At peak the building has 7 floors, of which two are the southern underground parking. In total there are 646 parking spaces within the stadium and further 570 outside. 512 trees were planted in direct vicinity.